The enchanting score of “The Nutcracker” is such a holiday season soundtrack that sometimes we forget that it’s only one part of an iconic dance piece. The city offers plenty of opportunities to see the visual aspects of the legendary ballet and understand why it’s such a classic. Opening the day after Thanksgiving and playing until January 3rd, this “Nutcracker” is the gold standard. Playing at Lincoln Center, NYCB puts on one heck of a show. 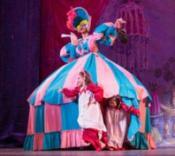 This production is quite heavy on spectacle and magic (the Christmas tree grows to over 41 feet!). Tickets start around $75 each, which is comparable to most Broadway productions. There are double performances on Wednesdays, featuring 2pm matinees. Bringing the younger members of the family to a full ballet performance may seem a little daunting. Perfectly suited for ages three and older, this company presents a one-hour adaptation. Although it only plays for one weekend at the Florence Gould Hall on East 59th Street, the schedule is very accommodating for parents, with performances only in the afternoon. Tickets start at $24, making this a more economical choice for your family. 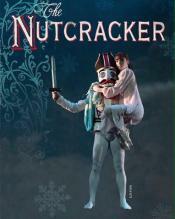 Six performances of “The Yorkville Nutcracker” will grace the stage at the Kaye Playhouse at Hunter College. Playing the weekend of December 10th-13th, the production is set in late-19th century New York City and will include some dancers from the New York City Ballet. Saturday and Sunday each feature two performances including matinees. The Mark Morris Dance Company brings their swinging retelling to the Brooklyn Academy of Music (BAM) from December 12th-20th. This is definitely not your traditional “Nutcracker” combining comic book-inspired settings and retro-dance parties. Tickets start at $25 with matinee performances on December 13th and 19th. Dance students will present the full two-act holiday show, featuring the Fort Hamilton High School Orchestra playing live for all performances on the weekend of December 11th through 13th. The show runs for approximately 90 minutes at the NYU Skirball Center. On December 5th, award-winning dancers will perform the classic ballet. Performances are at 3pm and 5:30pm, each running approximately 75 minutes. Tickets are $40 for adults and $20 children. Although not a live performance, Symphony Space will also be showing the Royal Ballet’s classic production in HD on December 27th at 3pm. The Brooklyn Center for the Performing Arts presents a family-friendly version set in Colonial Yorktown, featuring ballet-dancing Minutemen fighting Mice in red coats. The performance is suitable for ages five and up and plays on December 13th at 2pm with tickets starting at $18. As part of their national tour, The Moscow Ballet will perform at the Kings Theater in Brooklyn. 40 classically trained ballet dancers from the land that brought us the timeless story will present “The Great Russian Nutcracker” on December 5th at 3pm. This performance may not be suited for younger children, as it runs for over two hours. This company will be presenting two distinctly different versions of the ballet. The first, playing on December 6th and entitled “The Nutcracker & The Mouse King,” is a 40-minute adaptation developed for young dancers. The second production is “The Knickerbocker Suite,” which gives the story a contemporary twist. Rather than the second act-taking place in the magical land of sweets, this production takes the audience on a journey through New York City, infusing the classic choreography with modern dance and settings. The performance runs one day only on December 11th at 7pm. Tickets are $20- $30. Playing at the Ailey Citigroup Theater (55th Street and 9th Ave), this 90-minute production features both professional dancers as well as younger students, allowing your kids to see their peers perform on-stage. This production only has two performances, on December 12th and 13th with tickets starting at $22.50. This dance academy will present their interpretation utilizing the talents of 70 international dancers, some of which are current and former students. 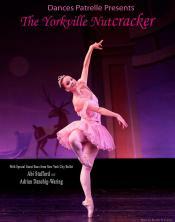 Gelsey Kirkland, a former New York City Ballet principal dancer, presents her school’s production from December 10th-20th, Thursday-Sunday at their facility in DUMBO Brooklyn. Tickets start at $20.